MakinaRocks, a fresh startup spun out from South Korea’s No.1 mobile carrier SK Telecom, has a bold ambition as its name: To shake the manufacturing world with machine intelligence. “We are applying artificial intelligence to the high-tech manufacturing sector with a mission to make manufacturing more productive by harnessing the power of data and AI,” Andre. S. Yoon, a co-founder of MakinaRocks told The Korea Herald on Tuesday. Among many in the broad manufacturing industry, the Korean startup is targeting the high-tech sector, including manufacturing of semiconductor products and equipment, automobiles, steel products and specialty chemicals, which requires complex technical processes. 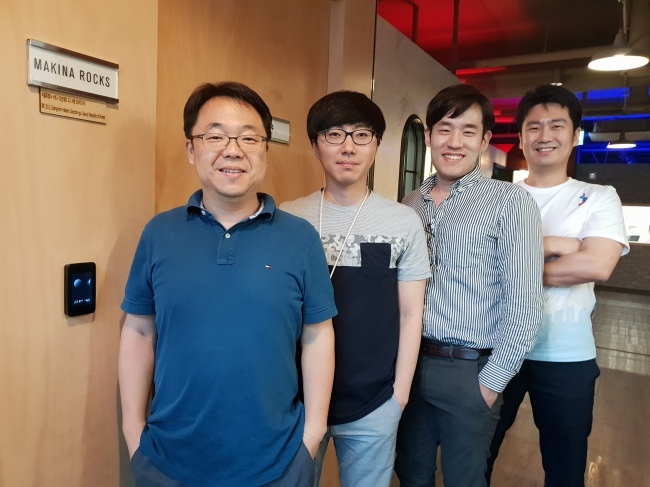 Established by two data scientists and an industry expert at SK Telecom’s ICT R&D Center in December 2017, the startup is joined by another data scientist from Samsung Electronics, and has been spun out from the telecom firm in May with the goals of contacting the world’s top players in high-tech industries and providing intelligent manufacturing solutions for them. By collecting and analyzing machine data from sensors, manufacturers can detect erroneous factors in processes early and prevent defects, thus improving efficiency in production, according to Lee Jae-hyuk, another co-founder of the startup. Applying AI technologies to production lines doesn’t mean automation nor replacement of human workers with machines, Lee said. Rather, the technologies enable predictions of optimal operations of machines. Despite being a month-old spin-out, the startup has the country’s most powerful industrial players as investors. It has received seed funding from SKT, No. 1 portal operator Naver and top automaker Hyundai Motor Company. It has also clinched a contract with one of Korean industrial players, and another one with a US company. Eyeing the US market with huge potential demand, MakinaRocks also has set up a subsidiary in Silicon Valley in the US, which will start operations next month with an estimated workforce of four to six, with an aim to hire up to 10 employees with multidisciplinary expertise in data science, AI and industries. “While the Seoul head office will focus on developing solutions for automakers and steelmakers with strong players here, the US office will serve mainly for chipmakers and equipment builders, oil exploration and production businesses, and specialty chemicals makers,” Lee said.